I read this book last year and it quickly because my favourite book of all time. Since it came out in January last year I thought it was a good time to re-read it and I'd forgotten just how much I loved this book. The Fault In Our Stars is the story of 16 year old Hazel who has a form of cancer that affects her lungs and 17 year old Augustus who lost his leg to cancer. Although cancer and illness are obviously one of the main themes of this book, it's about a lot more than that. I think one of the reasons I love this book so much is because it shows how 2 teenagers make the best out of the situations they find themselves in, often without meaning to. I also like the fact that what you think will happen doesn't and things don't always go their way. 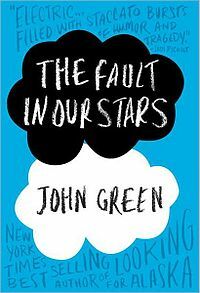 I also think the other characters are all really believable, from Hazel and Gus' parents to their other friends. I really can't recommend this book enough. I think it's truly one of the most amazing books I've read and it's one that, if I had the time, I would happily sit down and read cover to cover.